Well, I believe that we got everything done tonight like we had plan. Dinner at 5:00 with everyone ( except our Brad and Krystal, who are in Idaho), then Amy played the piano and we practiced some Christmas songs. Then Angie and I went outside and sprinkled Magic Reindeer food on the lawn ( that our dear neighbor gave to us ). Next we put milk and cookies out on our special Christmas plate for Santa, and put it by the fireplace ( and of course some carrots for the Rudolph and the other reindeers ). Then the girls got on their Christmas pajamas. Next, I read the Night before Christmas. 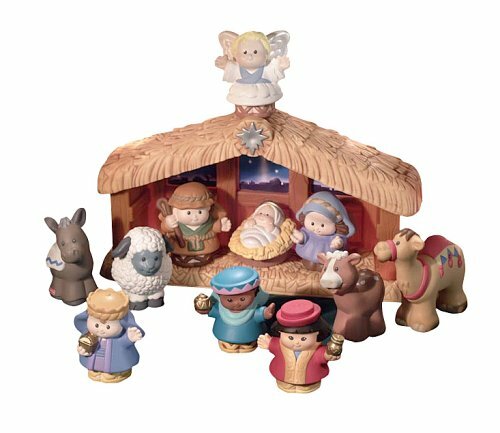 Then we got the Fischer Price Nativity down ( see photo below, every Grandmother and Nana, needs one of these! ), and the girls and I put all the pieces out on the table as Jeff ( Poppa ) read the Christmas story out of the book of Luke. That went pretty well, with only a couple of arguments over certain pieces of the nativity. After that, we bundled up and went to a home to do some Christmas caroling, it was fun and I believe the family that we visited enjoyed it ( or at least I hope they did ). Then back to our cars for some driving around to see Christmas lights, and then the girls were home before bed time at 8:00 p.m. ( Mission accomplished ). It was a neat experience and we were certainly grateful for it. Well, I am not sure anyone will actually read my blog tonight, being that it is Christmas Eve, put I still wanted to share this neat story with you. I hope you enjoy and that you have a wonderful Christmas! Oh no, it is late and I need to head to bed, I think I just heard the jingle bells from Santa's sleigh...gotta go! Just a week before Christmas I had a visitor. This is how it happened. I had just finished the household chores for the night and was preparing to go to bed, when I heard a noise in the front of the house. I opened the door to the front room, and to my surprise, Santa himself stepped out from behind the Christmas tree. He placed his finger over his mouth so I would not cry out. "What are you doing?" I started to ask. The words choked up in my throat, and I saw that he had tears in his eyes. His usual jolly manner was gone. Gone was the eager, boisterous soul we all know. He then answered me with a simple statement: "TEACH THE CHILDREN!" I was puzzled, what did he mean? He anticipated my question, and with one quick movement brought forth a miniature toy bag from behind the tree. As I stood bewildered, Santa said, "Teach the children. Teach them the real meaning of Christmas. The meaning of Christmas that nowadays has been forgotten." Santa then reached in his bag and pulled out a FIR TREE and placed it before the mantle. Teach the children that the pure green color of the stately fir tree remains green all year round, depicting the everlasting hope of mankind. All the needles point Heavenward, making it a symbol of man's thoughts turning toward Heaven. He again reached into his bag and pulled out a brilliant STAR. Teach the children that the star was the Heavenly sign of promises long ago. God promised a Savior for the world, and the star was the sign of the fulfillment of His promise. He then reached into his bag and pulled out a CANDLE. Teach the children that the candle symbolizes that Christ is the light of the world, and when we see this great light, we are reminded of He who displaces the darkness. Once again he reached into his bag and removed a WREATH and placed it on the tree. Teach the children that the wreath symbolizes the real nature of love Christ showed for us. Real love never ceases. Love is one continuous round of affection. He then pulled from his bag an ornament of HIMSELF. Teach the children that I, Santa Claus, symbolize the generosity and good will we feel during the month of December. He then brought out a HOLLY LEAF. Teach the children that the holly plant represents immortality. It represents the crown of thorns worn by our Savior. The red holly berries represent the blood that He shed for us. Next he pulled from his bag a GIFT and said, "Teach the children that God so loved the world that whoever believes in Him shall have everlasting life." (John 3:16) Thanks be to God for His unspeakable gift. Teach the children that the wise men bowed before the Holy Babe and presented Him with gold, frankincense and myrrh. We should always give gifts in the same spirit of the wise men. Santa then reached in his bag and pulled out a CANDY CANE and hung it on the tree. Teach the children that the candy cane represents the shepherd's crook. The crook on the staff helps to bring strayed sheep back to the flock. The candy cane is the symbol that we are our brother's keeper. He reached in again and pulled out an ANGEL. Teach the children that it was the angels that heralded the glorious news of the Savior's birth. The angels sang "Glory to God in the highest and on earth peace to men of good will." Suddenly I heard a soft tinkling sound, and from his bag he pulled out a BELL. Teach the children that as the lost sheep are found by the sound of the bell, it should bring mankind to the fold. The bell symbolizes guidance and return. Santa looked around and was pleased. He looked back at me and I saw that the twinkle was back in his eyes. He said, "Remember, TEACH THE CHILDREN the true meaning of Christmas and do not put me in the center for I am but a humble servant of the One that is, and I bow down to worship Him, Our Lord, Our God, and Savior. Kris Kringle: "Oh, but there is. I'm not just a whimsical figure who wears a charming suit and affects a jolly demeanor. You know, I... I... I'm a symbol. I'm a symbol of the human ability to be able to suppress the selfish and hateful tendencies that rule the major part of our lives. If... you can't believe, if you can't accept anything on faith, then you're doomed for a life dominated by doubt."